Tag Archives: Why Flexible Seating? Tour of my TOTALLY FLEXIBLE SEATING classroom! Enjoy a tour of our totally flexible seating classroom! Be inspired! In this article you will read what my students say about Flexible Seating! This is my scholar article! Flexible Seating more than seating! Please, provide your students with options to move! They need it! Kravitz Ph.D. (2009), on the British Medical Journal, says that even if children exercise in the morning or evening, but sit the rest of the day at a desk, rarely getting up, they would be at risk for significant and unhealthy blood vessel changes along with heart problems. Brain research also confirms that physical activity – moving, stretching, and walking – can actually enhance the learning process. Eric Jensen (2000), in his article Moving with the Brain in Mind, protests against the sedentary classroom style and suggests a better way to spend the long days in our classrooms, not only for students, but for teachers. Teachers need to engage students in a greater variety of postures, including walking, lying down, moving, learning against a wall or desk, perching, or even squatting. The brain learns best and retains most when the organism is actively involved in physical activity. This is a great article to gain insight of what we are doing in our classrooms with our students, are we promoting sedentary or movement? I am not too sure if I am ready to have my students standing up all day, but I am more than ready to put a few standing tables so my students can freely choose from many options including standing, kneeling, lying, seating, etc.! This is the link to that awesome article by the Mayo Clinic!!! And this is a great clip from the NBC news about what Dr. Levine from the Mayo Clinic is doing! Thank you Doc!!! This is a presentation that you can freely use to show it to your supervisors if you want to implement flexible seating in your classroom! Enjoy! We did it, my students and I are so proud of our accomplishments!!!! Today’s schools are no different than the ones in the 1800s! “Well, wait!” you might say, “A lot has changed since then, curriculum has changed, seating arrangement has changed, discipline has changed, books, technology, resources, many things have changed!” Unfortunately, one everything has not changed, and that is the sitting requirement that we impose on our students. Students are still required to sit for seven hours, on the same chair, on the same hard chair. We may even have group desks, and not arranging them in rows and columns, but the child is still asked to remain seated quietly as can be for most of the day. Health Corps (2009) reminds us that there was an advertisement many years ago that would flash before the late evening news, “Do you know where your children are?” It was aimed at parents, to raise awareness that we need to know where our kids are, and what they’re doing, especially in the late night hours. Now, health and children’s advocates say that we should now be asking, “How many hours do your kids sit daily?” As expected, too many hours of sitting is bad for kids’ health. A prior study by Kravitz (2009) on the British Medical Journal suggested that adults, and especially children, need to avoid sitting for too long. If we don’t move often during the day, the risk rises for certain health changes in our body that predispose us to disease. The telomere length of certain cells in our body is associated with healthy lifestyle and longevity. Prolonged sitting causes telomeres in our body to lengthen. When telomere length is longer, our overall lifespan may be shortened. With kids it is the same way, if not worse. Kids who sit for too long periods of time may have similar, adult-type health consequences. Even if children exercise in the morning or evening, but sit the rest of the day at a desk, rarely getting up, they may be at risk for these significant and unhealthy blood vessel changes. That also means that if students play a sport for an hour or two a day, but sit in school and at home for the rest of their waking hours, they too are at risk of developing these early, ominous heart-risk provoking changes. Globally, kids sit on average 8.5 hours. Specifically, movement and activity really drops after age 8. That’s of course, when school, homework and tech devices take over kids’ lives. Reynolds (Science of fitness, 2015) also agrees that children are sitting too much. He adds that children who sit too much may face adult-size health consequences. The study found that after a single session of prolonged inactivity, the children developed changes in their blood flow and arteries that, in grown-ups, would signal the start of serious cardiovascular problems. Many epidemiological studies have found associations between multiple hours of inactivity and increased risks for diabetes, obesity, heart disease, liver disease, metabolic syndrome and other conditions, including premature death. Most worrying, these risks remain elevated even if someone regularly exercises but then settles into his or her chair for the rest of the day. “It seems clear from our results that children should not sit for prolonged, uninterrupted periods of time,” (Dr. McManus 2015). So, we as teachers need to encourage children to stand up and move around at least every hour. A stroll around the classroom or living room should help. Dr. McManus suggests that vigorous exercise is not required to keep children’s arteries healthy. Unfortunately, chairs are as alluring to the young as they are to grown-ups. “I was surprised by how easy it was to get children to stay still for three uninterrupted hours,” Dr. McManus said. “We’d expected that they would want to be up and moving around.” But they were content to sit, entertained by movies and iPads. James A. Levine (2005) also says that research has linked sitting for long periods of time with a number of health concerns, including obesity and metabolic syndrome — a cluster of conditions that includes increased blood pressure, high blood sugar, excess body fat around the waist and abnormal cholesterol levels. Too much sitting also seems to increase the risk of death from cardiovascular disease and cancer. Sitting in front of the TV isn’t the only concern. Any extended sitting — such as behind a desk at work or behind the wheel — can be harmful. What’s more, spending a few hours engaged in moderate or vigorous activity doesn’t seem to significantly offset the risk. The solution seems to be less sitting and more moving overall. Students need to start by simply standing rather than sitting whenever they have the chance or think about ways to walk while they work. The impact of movement — even leisurely movement — can be profound. For starters, these activities burn more calories. This might lead to weight loss and increased energy. Even better, the muscle activity needed for standing and other movement seems to trigger important processes related to the breakdown of fats and sugars within the body. When students sit, these processes stall — and their health risks increase. When students standing or actively moving, they kick the processes back into action. Dr. James Levine, co-director of the Mayo Clinic and the Arizona State University Obesity Initiative, and author of the book Get Up! Why Your Chair Is Killing You and What You Can Do About It, has dedicated a good part of his career to investigating the health effects of sitting. Teachers, scientists and doctors all over United States have been thinking about it and decided that it is about time to bring a solution to our sedentary lives and our bad habits are being copied and forced to follow by our students. The following real story represents the journey of every teacher who decided to make radical changes in their classrooms. 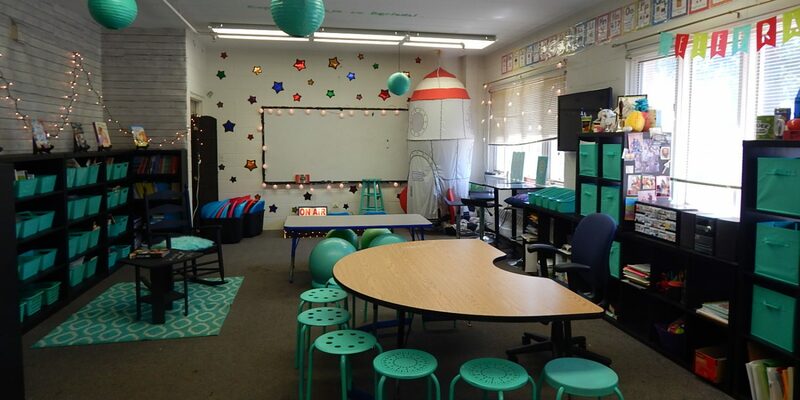 After consulting Erin Klein, a classroom design guru who has been “ditching her desks” to avoid “the cemetery effect” for a few years now and sharing her experiments on her blog, she thought about her classroom and the traditional chairs and tables she was given—and she came up with a plan. Looking around her classroom, she quickly realized that she had far too much furniture, so she got rid of four tables, her huge teacher desk, 20 traditional chairs and a file cabinet. Next, she started looking for resources to redesign and repurpose what she already had and could be used in her classroom. What came out of that was flexible seating and open floor space. Now, she has a large, open area for whole group instruction and five remaining tables, each designed with a specific purpose: a small group instruction whiteboard table with stools. a stand-and-work table with no chairs, a crate seats table, a sit-on-the-floor area with core disks or pillows and work table (see to the right), and a stability ball chairs table. Delzer proves that behavior issues and distraction are reduced in this environment. “the behaviors of my students who have exhibited aggressive or distracting behaviors in the past have significantly decreased.” There is power for them in the choice to select where they will work. They know the work isn’t optional, but choosing where they work is. Since desks are not present anymore, you might ask where the supplies go! Mrs. Delzer suggests having work bins in the corner of the room where students keep folders, math journals, and other personal items. They use community supplies at each of the five tables, and she also has individual baskets of supplies for students that choose to work on yoga mats or work rugs. If we take a look at classrooms over the past 70 years, we are seeing the same type of learning environments, year after year. The world is changing, yet our classrooms are remaining much the same. Revitalizing space is a straightforward way to let students exercise choice in the learning environment and find academic success on their own terms. Teachers across the United States are switching daily to this type of classroom; teachers even encourage each other on blogs and social media posts. Teachers call it the train, where many teachers jump in every day. Brain research also confirms that physical activity – moving, stretching, and walking – can actually enhance the learning process. Eric Jensen (2000), in his article “Moving with the Brain in Mind”(Education Leadership Magazine), protests against the sedentary classroom style and suggests a better way to spend the long days in our classrooms, not only for students, but for teachers. Teachers need to engage students in a greater variety of postures, including walking, lying down, moving, learning against a wall or desk, perching, or even squatting. A slanted desk means less fatigue, better concentration, less eye straining, and better reading. Students experience less painful electromyogram activity in the lower back when they use slanted work surfaces instead of flat ones (Eastman & Kamon, 1976). Teachers should regularly engage students in movement. “The data suggest that exercise is the best overall mood regulator” (Thayer, 1996) The brain learns best and retains most when the organism is actively involved in exploring physical sites and materials and asking questions. “Merely passive experiences tend to attenuate and have little lasting impact” (Gardner, 1999. pg. 82). Active learning has significant advantages over sedentary learning, which are: more can be remembered, they can have more fun, the styles can be more age appropriate, and can be more intelligence independent and that reaches more learners. Active leaning is not just for physical education teachers – that notion is outdated. Active learning and flexible seating are for educators who understand the science behind the learning; this is why teachers across the United States are switching daily to flexible seating in their classrooms. Teachers and students love it! lying down on their tummies or backs! Students tell that the room is not only relaxing, but also makes them feel cared about and understood. Parents might even have this kind of question or even other, so the following is a letter to parents, who are an important element at the time of making the changes. We need to have their support, they need to be aware of what is happening in their child’s classroom, and why they change is taking place. Check this great blog that contains also a letter to parents explaining what flexible seating is all about. After all, you need to bring parents on board!!! Flexible Seating is loved by students and teachers, is needed by students and teachers, and it is much deserved. Help me to make the change that should have taken place more than a century ago in the American classrooms and around the world. Studies prove that flexible seating is not only a good think, but a necessary one to improve health and learning. Would you help me make a difference in the world by changing one classroom at a time? Bjorklund, D. F. B., R. D. . (1998). Physical play and cognitive development: integrating activity, cognition, and education. Child Development. Eastman, M., & Kamon, E. . (1976). The effects of emotion on cue utilization and the organization of behavior. Human Factors, 18(1), 15-26. Emnett, A. (2015b). Alternative Seating This Year! St. Luis, Missouri. Gardner, H. (1999). The disciplined mind. New York: Simon & Schuster. Jensen, E. (2000). Moving with the brain in mind. Educational Leadership, 58(3). Reynolds, G. (2015). Gretchen Reynolds on the science of fitness. Thayer. (1996). The origin of everyday moods. Just imagine being seated for about 7 hours on a hard chair every single day. Imagine being 7-years old and being told to remain seated still while doing your work! Children need and deserve flexible and alternative seating in an environment where they spend almost the whole day every week. Don’t you think? Well, I decided to join many teachers across the United States who are changing the way children learn at school. As a teacher, I believe that by providing flexible, soft, and alternative seating to little ones, they would be able to move, release their energy, be happier, and more comfortable while doing their work. Now, just imagine little ones coming to school knowing that they will be learning in a kid-friendly environment. They need and deserve to feel at home, after all, school IS their second home! This is the one stop to get all the ideas and resources of this train on which teachers are jumping in daily!